Description: Gray wolves are the largest of the canine, or dog family. 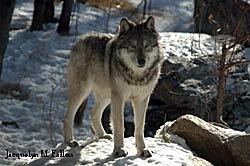 Gray wolves generally weigh between 60 and 110 pounds, with the females slightly smaller than the males. Their average body length is 5 ½ feet from the tip of their nose to the tip of the tail, and they reach 26 to 32 inches high at the shoulder. There is a wide range of coat colors which may vary geographically. A typical gray wolf's coat is gray mixed with tan, yellow, brown, and black markings, but , some wolves may vary from solid black to buff white. Wolves have a blocky muzzle and snout and smallish, round ears. When wolves are walking or running, they often hold their tails straight out. Range and Habitat: At one time, gray wolves were among the widest-ranging land mammal, found on every continent except for Antarctica and Australia. Red wolves, another species of wolf, were historically found in much of the southeastern United States and are currently found only in North Carolina. In North America, gray wolves are currently found throughout Alaska and Canada, and in a few areas in the lower 48 United States. Wolf populations exist in the Western Great Lakes states of Minnesota, Wisconsin and Michigan, the Rocky Mountain states of Montana, Idaho, and Wyoming and a few remote areas of Arizona and New Mexico. Wolves are extremely adaptable, living from arctic tundra to mountains and grassy plains. They are able to survive almost any climate or terrain where sufficient food is available. Basically, wolves can survive where there is enough prey for them to eat and where humans will tolerate them. Diet: Wolves evolved as a predator of large hoofed mammals. A tightly organized social structure enables them to work cooperatively to bring down prey that are much larger than themselves. They are opportunistic and usually kill what is easiest to catch such as the weak, sick, injured, old, and very young. Wolves also scavenge carrion, and take healthy, strong animals when possible. Living in a "feast or famine" world, wolves often go several days without successfully making a kill, but can gorge themselves and sometimes consume 20 pounds when a hunt has been successful. In the wild in North America, gray wolves prey primarily on large, hoofed mammals such as white-tailed deer, mule deer, moose, elk, caribou, bison, Dall sheep, musk oxen, and mountain goat. Medium-sized mammals, such as beaver and snowshoe hare, can be a important secondary food sources. Occasionally wolves prey on birds or small mammals. Breeding and Maturation: The pack's social structure generally determines which wolves breed, usually only the dominant wolves or breeding pair mate and produce a single litter of pups. However when prey in winter is abundant, a wolf pack may occasionally have multiple litters born that spring. In northern climates such as Minnesota, the mating season is usually early January through late February, with a litter of 4 to 6 pups born 63 days later in a den. A den may be located in a rock crevice or a hole dug by the parents or even a tree stump. The pups are born deaf and blind, but can hear within a 12 to 14 days. After 3 to 6 weeks, the pups usually leave the den and begin to investigate their surroundings, staying close to the safety of the den. As the pups mature, the pack moves to a more open area or "rendezvous site" within their territory. By fall the pups are large enough to travel and hunt with the pack. Wolves generally reach adult size by six to eight months of age and are usually sexually mature by 22 months. Miscellaneous: The natural causes of wolf mortality are primarily starvation, which kills mostly pups, and death from other wolves due to territorial disputes. Diseases such as mange and canine parvovirus can be a concern in small and recovering populations. Injuries caused by prey also result in some deaths. Human-caused mortality including legal, illegal, and accidental causes can be high in some populations. Pup mortality rates are highly variable, but 40 to 60% of wolf pups die each year. Few wolves live longer than 4 or 5 years in the wild; in zoos, they may live for 12 to 14 years. The maximum longevity for a wolf in the wild may be up to 13 years and in zoos wolves have lived to be 18 years old. Where to see a Gray Wolf in the U.S.